The Romeo y Julieta Sport Largos is a flavorful mild-medium bodied Short Panetela, 4.6” (117mm) long, of 35 ring gauge, and comes in a 25 cigars box. Machine made and wrapped in cellophane until 2002, this cigar is now handmade and can be compared to a H Upmann Epicures, in terms of size or strength level. It has the typical Romeo y Julieta flavors, perhaps a bit harsher than the usual cigar from the brand, but it is never too strong. It is a cigar that can be enjoyed at any time of the day for a short break. It develops a wide array of flavors in such a short time, which is not an easy feat, some wood, some fruit, nuts, caramel and some floral notes. It is therefore a perfect cigar for anyone who wants to discover Cuban cigars. The Romeo y Julieta Sport Largos is a very good option for a flavorful cigar and when the time is of the essence. • Mild to medium smoke, it makes it a perfect smoke for beginners. 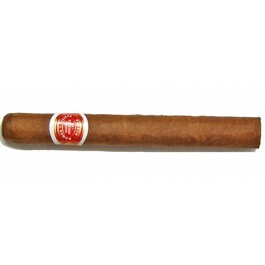 This cigar simply delivers a great Romeo y Julieta experience in a short smoke. The cigar is looking a bit rough, with few bumps but there are no soft spots. Its wrapper has a Colorado color (reddish brown), there is a slight amount of oil on it, and the cigar has a nice light box press. The wrapper smells of barnyard, caramel and salty wood. Once cut, the draw is good, and at cold, it gives lots some acidity from fruits, some herbal characteristic and some sweetness from caramel, nuts. There is also a pinch of salt on the lips. When lit, the burn line is neat and sharp, and the ash builds up to about an inch before falling. The first third of the cigar starts off with typical Romeo y Julieta flavors, some nuts, some wood mixed with some herbal notes. The flavors are very mild overall, there is also some fruity tobacco notes, some earth and also some sweetness. The strength of the cigar is between mild and medium during this first third. In the middle third, the dominant flavors are still of wood, coffee, but the flavors are getting more intense, with some aromas reminding of leather. The cigar is now a medium body. The smoke is becoming denser, creamier and spicier, but never too harsh. It is very enjoyable. In the final third, the flavor profile is similar to the middle third, the flavors only ramping up again, with some more pepper as well. The finish is long and sweet. A very good final third, the strength is still on the medium range. In summary, despite being a short smoke, it packs a great blend, not very complex, but delightful nonetheless.